– A recent survey of volcanoes in the Kermadec Arc north of New Zealand suggest that there is abundant – and recent – undersea volcanism. Scientists from University of Washington (one of my former homes) and Southhampton University (UK) explored a number of submarines volcanoes including Rumble II West, Rumble III and Brothers, which are all located along the same arc of volcanoes as New Zealand’s own White Island and Mt. Edgecumbe. What they found was a change in the shape of Rumble III (1.4 km below the sea surface) since the last survey in 2007 – the summit crater has been filled and the height of the summit cone is almost 100 m shorter! Sounds like that would have been a significant eruption for that sort of physiographic changes to the volcanic edifice. Previous to this, the last known eruption at Rumble III was in 1986, but the only known eruptions are based on hydrophone evidence. They also found abundant “black smokers” on Brothers Volcano. The map of Rumble II West (above) also shows what appears to be a caldera-like feature with a new cone growing in the center. Studies like this always make me wonder how many eruptions occur under the surface of the ocean that go unnoticed. – If you’re into historical accounts of volcanic eruptions (and who isn’t? 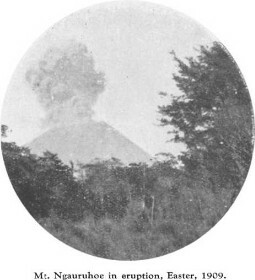 ), you might enjoy the snippet posted in the Otaga Daily Times from 1909 entitled “Little to fear from Ngauruhoe’s eruption”. Mt. Ngauruhoe (which is really just the youngest vent of Mt. Tongariro) erupted 100 years ago on March 11 (see above), the original articles reports that the eruption was “the finest seen in New Zealand for years.” The eruption in 1909 was one of many of the volcano in the 20th century, explosive eruptions of ash and debris with moderate intensity (VEI 2). //Below are the comments from the original posting of this article. given the relative proportion of the earth that is covered by water compared to land and the various plate boundaries, should one assume that there are many more underwater volcanoes than those that reach above sea level (continental and island arc)? Do tell, Dr. K! Just want to say that I check the world earthquakes and volcanoes. We have underwater vents in Canada, even. If it’s on the Ring of Fire, and in water, I’d guess there’s a pretty good chance of underwater volcanoes. Wow! that’s almost like Indonesia! Erik, I just had a thought, do you think the volume of rhyolite produced by the TVZ has something to do with the fact that the plate boundary is actually dissecting (or trying to) the submerged continent of Zealandia? I read one report a couple of years ago that theorized that melt from the plate boundary was being transferred north from the south of the North Island to be pooled under Taupo .. (this was also to explain the absence of volcanism south of Ruapehu) but couldn’t the volume of rhyolite simply be a product of the thickness of the Zealandia continent itself? Does anyone know of any other regions where plate boundaries are actually dissecting a continent (and no, I don’t mean rift scenarios).. Is there any comparable volcanism? I’d be interested to link the location of these volcanoes with current earthquakes so that maybe we could get a sense ahead of time which volcanoes may continue to be active – or be in danger of erupting. Now are all these volcanoes that you are talking about underwater? And how close are they to breaking through to the surface and how dangerous would that be? So if any breaks through to the surface would it pose any threat for worldwide climate? I am thinking anything that might be Pinatubo size or larger. We have gone a number of months with a dearth of meaningful sunspot activity. Even the occasional sunspot now is often tied in with the last sunspot cycle. A few degrees cooler – like what Pinatubo generated on top of a presently cooling off earth may translate into meaningful or substantial cooling. first thanks for your feedback on my post the other day. The best way to trace the correlation between the earthquakes and these volcanoes is probably still via the USGS earthquakes site and then when one happens click on the link to Google Earth. I know there are plans to put the seabed into Google earth but I haven’t seen anything yet. There has been a lot of earthquake activity along the Kermadec trench but from what I have seen most of it has been in the subducting Pacific plate rather than volcano related. I’d like to see comparable studies for up near Tonga because they have positively huge rates of subduction up there and all that material must result in some volcanism someday, me thinks. UPDATE 2/19/2009 9:45 AM: Well, it seems that my hunch was at least partially right. Reuters (and Paula Narvaez, special envoy to the Chilean president) is calling the eruption as result of “what appeared to be a partial collapse of its cone.” So, we might have seen the oversteepening of the dome growing in the Chaiten caldera that lead to a collapse, producing (likely) a pyroclastic flow and either an accompanying plinian eruption as the pressure was released or an ash column associated with the pyroclastic flow itself. Now, I might not take Reuters word for it, but it makes sense considering the suddenness of the event. 10:00 AM: More details for Reuters, including the ominous “Our security team have observed an increase in the size of a column of ash and smoke, with a deformation to one side” from the Deputy Interior Minister. My guess is he is referring to deformation on the ash column, not the volcano. Eruptions reader Brian Owens has pointed out that fellow volcano follower, the Volcanism Blog, is reporting that Chaiten is experience a major rejuvenation today. Sure enough, the Associated Press also reporting that an explosion has occurred in the main dome of Chaiten that has been built since last May and that material is moving downslope from the explosion. There is no clear word what type of volcanigenic material this might be – pyroclastic flow, lahars, avalanche – but there is a major fear that it could block the river and cause flooding in the town of Chaiten. The few citizens left in the area are being evacuated. The Patagonia Times adds that the eruption started around 11 A.M. (local time) and ash has spread across much of the region. From what I can gather, this seems like it might have been either a dome collapse that was quickly followed by an explosion (possibly caused by the release of pressure from the collapse) or some “burp” of gas-rich magma erupting. The reports of “a massive column of ash” are interesting as this could suggest a true new flux of magma, but it is hard to tell at this point how widespread is the ash and how tall the column might be. At this point, it is all conjecture, but it sounds like Chaiten might be making a comeback. The questions woulds be how big and for how long. The Anchorage Daily News has an excellent article today on the Drift River Oil Terminal, a depository for oil collected from the platforms in the Cook Inlet. This oil terminal stores at least 1,000,o00 barrels of oil (see article for why we’re not sure) and sits, well, at the base of Redoubt (see map below from Anchorage Daily News) on the floodplain of the Drift River (~25 miles from the vent). Now, this oil terminal was more-or-less destroyed during the last episode of volcanism at Redoubt twenty years ago when the terminal was wiped out by floods resulting from the eruptions. Not only did this cause the retrieval of the oil left at the terminal to be an immense problem, but it shut down production in the Inlet for 10 days … and we all know what this kind of news does to gasoline prices. I wish we knew more about what is being down about the oil terminal, because it could be a great example of when volcanic mitigation is ignored … or alternately, if Chevron is actually doing something about it, when it is paid attention. It doesn’t take a team of experts to realize that the placement of the terminal in a flood plain at the base of an active volcano might not be the best location in the Inlet. Combine that with the fact that, although a flood took out the facility in 1990, there is no guarantee that other volcanic hazards with a little more “oomph” might not be able to reach the facility, dike or not. The Drift River Oil Terminal is one of those situations where a little forethought into its placement might save Chevron and the country a lot of hassle and worry. As for the current state of Redoubt, as of noontime (Pacific) on 1/31/09, AVO reports “Seismicity remains relatively unchanged since 3:30 PM AKST yesterday afternoon. It is still well above background.” The wait continues! It is hard to believe that the eruption at seem to come out of nowhere at Chaiten started over 8 months ago now, and apparently is still not showing many signs of abating. I did get a chance to see some great talks and posters at AGU last month about the Chaiten eruption, with the key points I took away being that Chaiten is erupting a very crystal poor rhyolite (<1% crystals) and that it seems that the source of the magma is relatively deep in the Andean crust. Also, there are some indications that the eruption at Chaiten may have been tectonically instigated – i.e., that earthquakes in the area might have helped the magma to erupt – at least that is what Luis Lara of the SERNAGEOMIN believes (hat tip to Thomas Donlon for the link). The eruption at Chaiten also wreaked more havoc on aviation in South America than we thought, effecting airports 1000s of kilometers away and almost bringing down a number of aircraft. Most everyone I talked to seems to think what we are seeing is very similar to what happened at Little Glass Mountain in California about 1,000 years ago. I wouldn’t normally use this blog for something like this, but google has failed me. When I was in New Zealand, I saw a video on the 1995-96 eruptions at Ruapehu titled Witness to Eruption made in, I believe, 1999. It had some excellent footage of the eruptions in the 1990s as well as the 1950s, along with some great examples of interactions between the populations/businesses near the volcano and the eruption (namely the ski areas). I assumed I could get back to the states and look up the video on google to buy a copy, but no luck! Does anyone have any knowledge about where I could find this video for purchase, hopefully on DVD? Leave a comment or send me an email if you have any information. One of the more impressive areas I visited while in New Zealand was the Waimangu Valley near Mt. Tarawera (above). 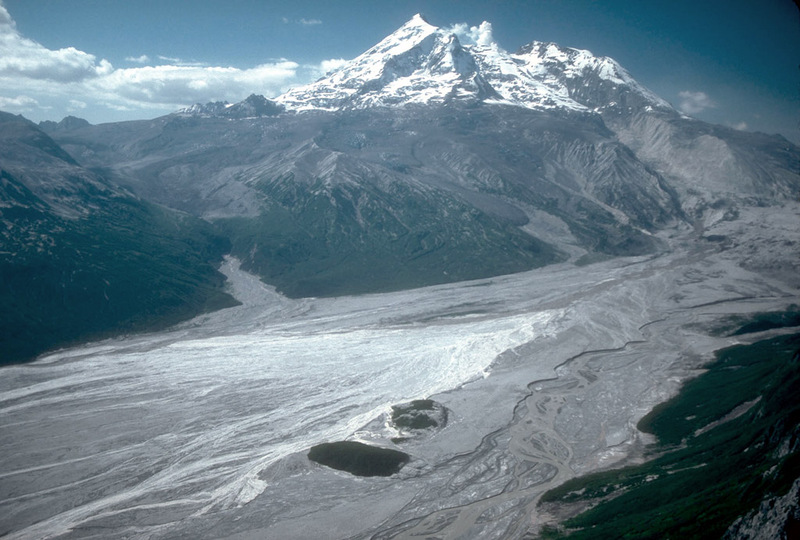 The valley itself was created by blast explosions (phreatic explosions) during the 1886 eruption of Mt. Tarawera. These eruptions cut right down the axis of the rhyolite domes (most of which erupted ~1305 A.D.) and extended off the volcanic edifice to form the valley to the west of the volcano. In the valley, no juvenile lava was erupted, instead explosions carved out large pits that formed the Waimangu Valley and today the valley is filled with lakes and thermal features (below). The 1886 eruption at Tarawera was not large by any means, erupting only ~0.7 cubic kilometers of basalt (compare that with the 1305 Kaharoa Rhyolite from Tarawera that erupted 5 cubic kilometers). 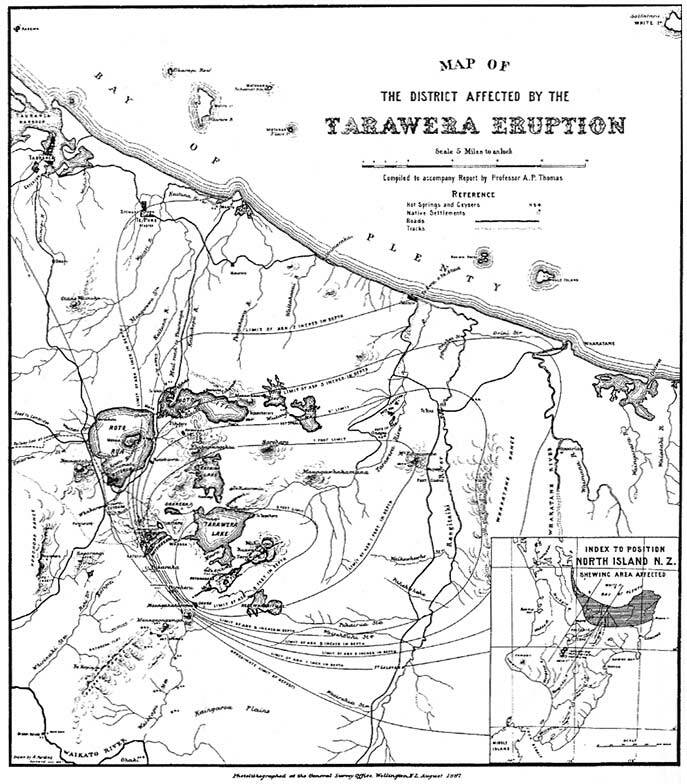 However, hundreds of Maori villagers died during the eruption and basaltic tephra can be found all over the area north of Tarawera into the Bay of Plenty. Yet, only about a century later, most of the destruction caused by the eruption has been erased by vegetation. Compare the photo of the valley just after the eruption (top) to the one I took in January of 2009 (bottom) to see how things have recovered. Volcanoes are truly destructive, but still just a flash in the pan for most earth processes. I made it back from New Zealand yesterday after spending the last two weeks looking at some of the most remarkable volcanic landscapes you could imagine. I’ll add more detail soon for those of you interested in the volcanism of the North Island, but I’ll leave you with a picture of yours truly in from of Ngauruhoe (a.k.a Mt. Doom) along the Tongariro Crossing. The volcano last erupted in 1977 and it considering the youngest vent of Tongariro. Ngauruhoe has had >60 eruptions over the last 150 years. Right as Yellowstone is getting interesting (or at least had signs of interest), Eruptions is going on a bit of a break again starting January 2. This time it is because I’m off to the North Island of New Zealand to do some field work. I’ll be headed to Tarawera (hopefully both the 1305 and 1886 eruption deposits), Taupo, Tongariro, the area around Rotorua and maybe even White Island (amongst other). I won’t have my MacBook, but I will have my iPod Touch, so I’ll try to keep track and make brief posts if something big comes up, but feel free to use this post as a clearinghouse for any news or articles you run across until I return on January 16th. Happy 2009 to all the Eruptions readers! Yellowstone looks to be keeping everyone on their toes as we ring in 2009. The earthquake swarm reported earlier this week is continuing, with multiple events between 2-3.5 on the Richter Scale. Again, the folks monitoring the caldera – this time the Univ. of Utah – play down these events as normal for any active caldera system … and they’re very likely right. However, the media love to bring up the “supervolcano” angle and we’re even getting expert opinion from (wait for it) Garrison Keillor!. The earthquakes are just normal earthquakes so far – none of the dreaded/anticipated harmonic tremor that might indicate an eruption. This will likely mean that more gas and water monitoring will be occurring in the park in the coming weeks/months. 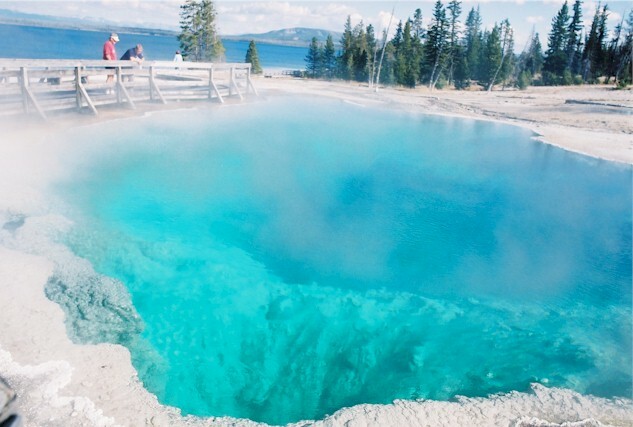 Is Yellowstone making plans for 2009? 2008 is almost finished and we’ve seen one of the few high-silica rhyolite eruptions in the past 100 years at Chaiten in Chile. Chaiten was definitely not high on the list of potential locations for a rhyolite eruption worldwide. However, Yellowstone Caldera in Wyoming definitely is high of the list because it has erupted a lot of rhyolite over the last few 100,000 years (even discounting the big so-called “supervolcano” eruptions). This is why the current news of an earthquake swarm at Yellowstone is, in the very least, really interesting. The earthquakes – over 250 of them – started yesterday and many of them were as high as magnitude 3.8 on the Richter Scale. The earthquakes are centered under Yellowstone Lake and the depth is poor constrained according to the USGS, but they appear to be shallow. Even Yellowstone expert Robert Smith (Univ. of Utah) say the swarm is “very unusual”. However, YVO plays down the event. The earthquakes might be related to hydrothermal fluids moving in the crust, they might be tectonic or they might be magma moving (but not to the surface). Definitely gives us something to keep an eye on as 2009 begins.